My Field Investigations in Biology class stopped by the Brakefield Road salamander pond today. This pond is a large ephemeral wetland in the upland forest near Sewanee. It is home to dozens of animals that are found in no other habitats here. These animals thrive because the intermittent drying of the pond keeps out predatory fish, allowing salamanders, frogs, crustaceans, and others to thrive. 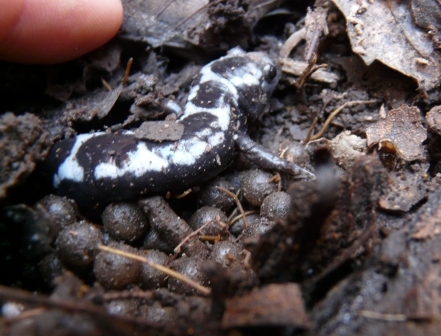 Today, we found a female marbled salamander (Ambystoma opacum) guarding her eggs. This species lives under the ground or under logs for most of the year, then comes to the dry pond beds in autumn to breed. The females make nests in depressions on the pond floor, usually under logs. They stay to guard their eggs until rain fills the ponds and the young hatch out. This entry was posted in Salamander on October 25, 2011 by David George Haskell. totally awesome. I always wonder what sort of ferocious guarding a salamander really does without incredibly sharp talons or anything. Most predators are other salamanders (incl. newts) and maybe frogs. I think they also eat any eggs that have fungus on them — protecting the whole brood. Obviously a raccoon would have no problem.